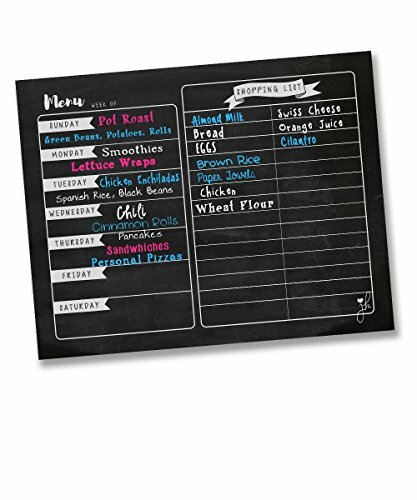 Jennakate Chalkboard Design- Magnetic Dry Erase Menu – Weekly Refrigerator- Ideal for Shopping List, Checklist, Health and Diabetic Meal Planner -18″x14″ | Where Do I Go? EASY TO ERASE! **Use HIGH QUALITY Liquid Chalk Markers for vibrant colors and visibility. ** VERSATILE! Great for meal planning, diet tracking, or weekly planning. LARGE SURFACE! Plenty of space to write, easy to see. DURABLE! Our magnets have been rigorously tested for durability. Will not slip from your strong magnetic surface.GET ORGANIZED Keep track of your healthy recipes for the week with this Efficient Meal Plan Board. Great for dinner ideas and planning for weight loss! Our Magnetic Dry Erase Menu Planner is a great addition to your Family Command Center! GROCERY SHOPPING LIST – Keep a running list of Healthy Foods & Needed Grocery Items, and snap a quick photo of your list before heading to the store. LARGE SIZE – 18″x14″ Gives enough space for writing out your Weekly Meal Plan, and is also easy to read. GREAT for Kitchen Refrigerators (Does Not Work on Most Stainless Steel), Office File Cabinets, Dishwashers, Magnetic Boards made of Steel, or any strong, magnetic surface. Also fits standard frame sizes. DURABILITY – All JennaKate Magnetic Dry Erase Menus are made with the highest grade, 30 Mil Magnet, and include a heavy duty finishing coat of lamination. Our magnets have a sure grip, and will not slip or slide off of your Strong magnetic surface! THIS CHART IS A MAGNET. EASY to CLEAN – – We recommend using LIQUID CHALK MARKERS on our charts. If you choose to use Dry Erase Markers, make sure to use the highest quality markers. Some marker brands tend to leave streaks & smears. We are not responsible for the quality of the marker used. A dry erase cleaner spray may help keep your magnet clean.